Darstellung innerer Gedankenprozesse. Ob unter dem Stichwort „mind“, „consciousness“, „psyche“, „soul“, „inner life“, „nature“, „Geist“, „character“ oder welchem auch immer – Eliot verwendet in MM viel Energie auf die Darstellung innerer Bewusstseinsvorgänge. Eine wesentliche narrative Technik ist der style indirect libre (auch erlebte Rede; oder free indirect speech). 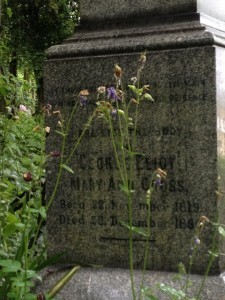 In the course of the novel, Eliot repeatedly speaks of her characters‘ ’soul‘ when she wants to show us their inner life. Equally often she speaks of their ‚mind‘ (or sometimes, though clearly less often in this connexion, of their ‚consciousness‘). Thereby she suggests a synonymical use of the terms ’soul‘ and ‚mind‘. Since it is impossible for a short essay like this to compare Eliot’s whole complex concept of ‚mind‘ and ’soul‘, I want to take a closer look on how ’soul‘ is described and used in Middlemarch and which narrative techniques go along with it. One major key term in the first half of Middlemarch, which is repeated several times by different speakers, is the „great soul“ (Eliot 19, 54-55, 770) of Edward Casaubon.1 When Celia asks Dorothea about her reasons to marry Casaubon, she regretfully answers that Celia „never see[s] the great soul in a man’s face.“ (Eliot 19), whereupon Celia with „a touch of naive malice“ asks: „Has Mr. Casaubon a great soul?“ (Ibid.) Dorothea’s following answer will prove as fateful in the second half of the novel. She replies: „‚Yes, I believe he has,‘ said Dorothea, with the full voice of decision. ‚Everything I see in him corresponds to his pamphlet on Biblical Cosmology. '“ (Ibid.). It is peculiar that Eliot in this central scene uses the technique of quoted monologue, as Dorrit Cohn calls it (Cohn 58-98), with the quotation marks clearly marking the beginning and end of Casaubon’s monologue. After several pages of authorial voice judging Casaubon’s (mis-)behaviour towards his wife, his disappointment in marriage, and his greatest fear, that he could die with his work still unfinished, Eliot suddenly (without even beginning a new paragraph) switches into quoted monologue. Dorothea’s great disappointment in Casaubon derives from the fact that she has „shut her best soul in prison“ for the benefit of his so-called ‚great soul‘, which turns out to be a lie and thereby negates all her former efforts of endurance. Furthermore it proves her own inability to succeed at „the difficult task of knowing another soul“ (Eliot 111; my italics). It is remarkable, that in this scene, Eliot does not use quoted monologue, as she did in the scene of Casaubon’s innerrevelation, but rather free indirect discourse. Of all occurrences of free indirect discourse in the novel the greater part is reserved for Dorothea’s inner life, and almost none for Casaubon’s. Observant as we are after this little speech on behalf of the poet’s soul, we cannot fail to see the importance of the first brief insight into Will’s own soul. We find Will on a Sunday morning in his room, his „inward debate necessarily turn[s] on Dorothea“ (Eliot 442) and his feelings towards her. In this very soul of his he keeps Dorothea „for ever enthroned“ (Eliot 441). What is remarkable here is that this is the first scene in the novel, in which the question of Will’s affection for Dorothea is unquestionably answered – namely in indirect discourse: „Dorothea, he said to himself, was for ever enthroned in his soul“ (Ibid.). Instead of using the (more or less) direct discourse of Casaubon’s quoted monologue (something like „Will said: ‚She is for ever in my soul! '“) or the free indirect discourse of Dorothea (something like „Oh, how sensible she was enthroned in his soul for ever!“) Eliot shows us the interior of Will’s soul in indirect discourse. I regard the quoted passage („Dorothea, he said to himself, was for ever enthroned in his soul“) as his first distinctive confession in the novel, though one could easily argue, that his love to her already becomes certain earlier – in passages that for example make use of direct discourse, or free indirect discourse. However, some critics have interpreted Will’s many passages of free indirect discourse as „fast sämtlich unwichtig“ [almost completely unimportant] (Glauser 134), compared to Dorothea’s passages of free indirect discourse, which express her emotional development from love of Casaubon, to her first notions of the failure of her marriage, to her rising distaste for Casaubon, and finally to her love for Will. Whether the terms ‚consciousness‘, ’soul‘, and ‚mind‘ are used synonymously in Eliot’s novel is difficult to decide. Slight differences are suggested, and soul is as expected more concerned with the inner life of emotions. But on the other hand there is always a cognitive aspect in souls, which can „discern“ (Eliot 209), „know[..] another soul“ (Eliot 111), can entertain certain „beliefs“ (Eliot 579), have „a strong practical intelligence“ (Eliot 236), are „conscious“ (Eliot 344), and are connected in some way „with the quickening power of […] knowledge“ (Eliot 181). Furthermore, they are often connected with visual metaphors, e.g. when it is said that they can be „double mirrors, making still / An endless vista of fair things before, / Repeating things behind“ (Eliot 691), that they can be seen „in a man’s face“ (Eliot 19), or with auditory metaphors, „since souls live on in perpetual echoes“ (Eliot 150-151), communicate as a „cry from soul to soul“ (Eliot 272), and they often appear as a „voice of a soul that had once lived in an Æolian harp“ (Eliot 74). Souls in Middlemarch are probably an extension of the concept of ‚mind‘. While the concept of ‚mind‘ is usually used for psychological analysis of certain characters it more or less completely lacks the two aspects which ’soul‘ has in addition to it, i.e. its visuality (souls can see and can be seen, they even can appear as „prophetic souls“ (Eliot 267) and see into the future) and its communicative aspect – souls can cry out to each other and make themselves hearable. Whenever Dorothea or Will are called „poor soul“ in the novel this could be read as an allusion to their soul’s deficiency to do what they are supposed to do: i.e. to communicate. It seems therefore barely a coincidence that both Will’s and Dorothea’s souls use an indirect form of speech – (mainly?) indirect discourse in Will’s case, (mainly!) free indirect discourse in Dorothea’s case. As for Casaubon this is hardly necessary, since he is clearly the most transparent character in this triangle. His soul is revealed in direct discourse and gives no surprise to the reader – it only confirms what was known about him in the first place. Eliot, George: Middlemarch. Penguin Classics, 2003. Cohn, Dorrit: Transparent Minds. Narrative Modes for Presenting Consciousness in Fiction. Princeton: Princeton University Press 1978. Glauser, Lisa: Die Erlebte Rede (The Interior Monologue) im Englischen Roman des 19. Jahrhunderts. Von Scott bis Meredith. Solothurn: Buchruckerei Gassmann 1948. 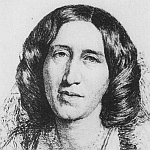 „George Eliot„, via Wikimedia [Lizenz: Public Domain because copyright has expired]. Dieser Beitrag wurde unter Englische Literatur abgelegt und mit 19. Jahrhundert, Bewusstseinsdarstellung, Realismus, Roman, Schriftstellerin, Viktorianische Literatur verschlagwortet. Setze ein Lesezeichen auf den Permalink. Wow, was für ein umfangreicher Artikel. Ich bin mit dem Lesen noch nicht ganz durch (also dem Lesen des Artikels meine ich, Middlemarch habe ich schon zwei mal gelesen). Viele der Aspekte in Ihrem Artikel fand ich sehr neu und anregend – das hat mir teilweise einen neuen Zugang zu Middlemarch und George Eliot gegeben. Ich würde mich sehr freuen, wenn Sie in Kürze mehr zu George Eliot, Middlemarch oder anderen Eliot-Romanen wie Daniel Deronda oder Silas Marner schreiben könnten. Erst mal aber vielen herzlichen Dank, dass Sie diesen wissenschaftlichen Artikel im Netz zur Verfügung stellen. Thank you for this great article on Eliot’s Middlemarch. I can’t say, that I understood every single word of it (unfortunately, my German is not very good) but I enjoyed what I understood. Thank you!